I have noticed that Google has a habit of sending me notification to surprise me of its cool creation of photo collage, stories, videos and animations with my already uploaded Google photos. Sometimes, it shocks me whether my photos are 100% secure although I knew these skillful creations were created by some intelligent Google algorithms. It all started with the Google Auto Awesome feature which now has tremendously grown creating animations and Panaroma in the name of Google Assistant. For those who wonder what a Panaroma is, it is nothing but an impression of having an extended version of the same image. Google+ algorithm stitches any two similar images and even blends them to give you a perfectly flawless photo. But have you ever wondered on how to do them manually by yourself? 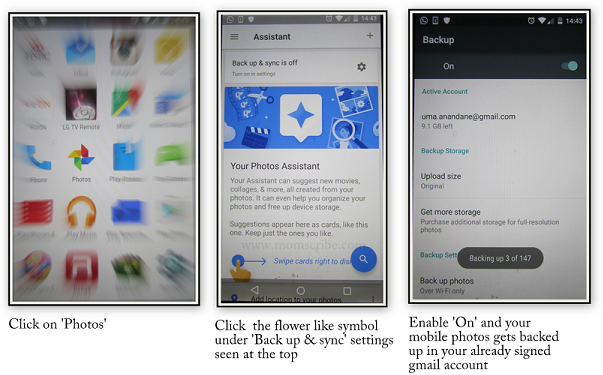 Yes, it is possible if you have installed the Google Photos app on your mobile phone or tablet. And with this so called Google assistant one can create movies, stories, animations and collages with just few clicks. It looks like that Panaroma is yet to be added to the lists but you can try your luck by uploading somewhat similar photos in a separate folder for the Google+ algorithm to take notice of. But the more easier way is to use your mobile phone's "Panaroma" feature if you have one or else try Picasa to manually create panorama using the collage trick. The first step is to click some photos using your mobile camera with slight movements of objects or people so that we can have a series of photos which we can make into an animation. In the below image, I use a doll with slight hand movements as if it waves its hand at you. Next, click on the "+" on the right corner of the app which fetches a menu with features like Album, Movie, Story, Animation and Collage. Click "Animation". Now, choose the photos you want to animate by selecting them and click "CREATE" seen on the top right corner. And thats all. The app does the rest of the work for you by uploading the images to your online Gmail account's Google photos drive and creates an animation. Another great feature is that you can share it to your family and friends through Whatsapp,Gmail and more. Or you can also download your animation as *.gifs too as I have done as above. Whatever you have created either animation or collages, you can find them easily in https://photos.google.com/. If not, it means that your mobile phone is not automatically synced to your online account for back up. In that case, follow the steps as below. Before proceeding, make sure you have added your Gmail account to your mobile using the Google Photos app. This will enable your G+ profile to be activated in your mobile. 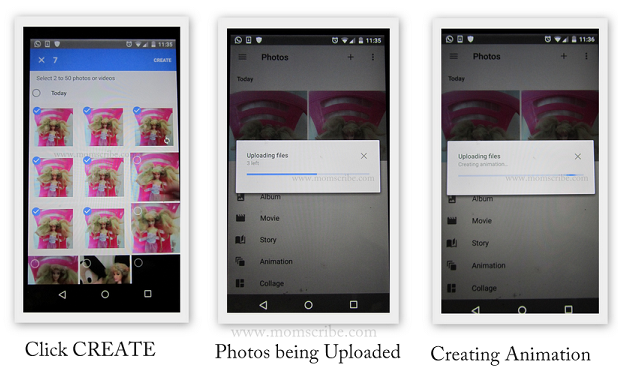 In the similar way, we can also create photo collage, story and animation using google photos app. Also another feature to explore is that using the "Edit" feature in your online Google photos you can use crop, rotate and use a number of filters to experiment.